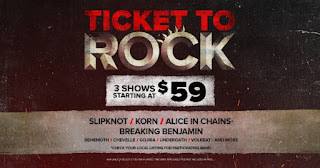 Live Nation, on Friday October 8, 2019, announced details for the 2019 Ticket to Rock– one ticket that gets fans in to some of the hottest rock shows all summer long. Artists included in this year’s package are: Alice in Chains, Breaking Benjamin, Behemoth, Chevelle, Gojira, Korn, Slipknot, Underoath, Volbeat & more. Full lineups and dates for the participating tours to be announced soon. In select cities, Shinedownand Slayerwill also be a part of the package. The multi-ticket package offerings will be available for 18 amphitheaters across the U.S. this summer including Ruoff Home Mortgage Music Center, Northwell Health at Jones Beach Theater, Jiffy Lube Live, and more. See full list of participating venues below. Ticket to Rock will include 3 or 4 show package options with two tiers of tickets available for each – lawn or reserved in the upper pavilion. Lawn ticket bundles for 3 shows will cost $59 and 4 shows will be $69. Reserved ticket bundles for 3 shows will cost $79 and 4 shows will be $89. Ticket packages will be available to purchase in limited quantities, while supplies last.